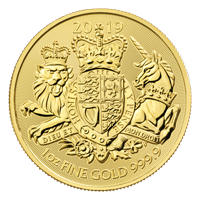 Purchase a 1982 1/10 oz Franz Joseph gold coin online at the lowest price! This striking coin pays homage to emperor Franz Joseph of Austria as a re-strike of the original coin from the Austrian Mint. On it's obverse, this gold coin displays the right bust of of Austria-Hungary’s emperor Franz Joseph I, surrounded by Latin phrases. The reverse portrays the crowned arms of the Austria-Hungarian empire in striking detail, the year, and it's 4 Florin and 10 franc denominational value. 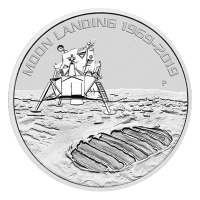 This coin is highly sought after by collectors, secure yours today! Vorderseite Eine Büste von Österreich-Ungarns Kaiser Franz Joseph I.
Eine Büste von Österreich-Ungarns Kaiser Franz Joseph I. 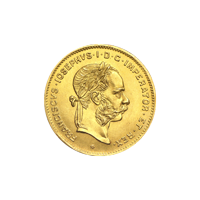 10 österreichische Franken Goldmünze - Franz Joseph 1892 Purchase a 1982 1/10 oz Franz Joseph gold coin online at the lowest price! This striking coin pays homage to emperor Franz Joseph of Austria as a re-strike of the original coin from the Austrian Mint. On it's obverse, this gold coin displays the right bust of of Austria-Hungary’s emperor Franz Joseph I, surrounded by Latin phrases. The reverse portrays the crowned arms of the Austria-Hungarian empire in striking detail, the year, and it's 4 Florin and 10 franc denominational value. 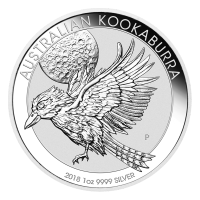 This coin is highly sought after by collectors, secure yours today!